By CORRESPONDENT, PRETORIA, South Africa Mar 27 – Kenya has re-affirmed its commitment to peaceful resolution of conflicts during the Southern African Development Community (SADC) Solidarity Conference with Western Sahara. “Kenya believes in the principle of the inalienable right to self-determination and has remained steadfast in its support of and solidarity with all peoples seeking their independence,” Namwamba said, representing President Uhuru Kenyatta. He said the right to self-determination is the foundation for the very existence of the nations of Africa. The two-day meeting, which started on Monday, was called by the 16-nation SADC and attended by leaders from nine African countries and ministers from as far away as Venezuela and Nicaragua. Several southern African leaders present threw their support behind Western Sahara, with one calling the disputed territory the “last colony” on the African continent. President Cyril Ramaphosa, leader of the continental powerhouse South Africa, described the gathering in the South African capital Pretoria as a “historic act of solidarity”. The gathering, is seen as a historic solidarity that creates an opportunity for leaders to reaffirm their commitment to the rule of law and celebrate a rules based community of nations. “The right to self-determination is the primary motivation that inspired the great heroes of the African independence movement, from Jomo Kenyatta to Nelson Mandela, from Ahmed Ben Bella to Kwame Nkrumah, Sam Nujoma to Samora Machel, and more. 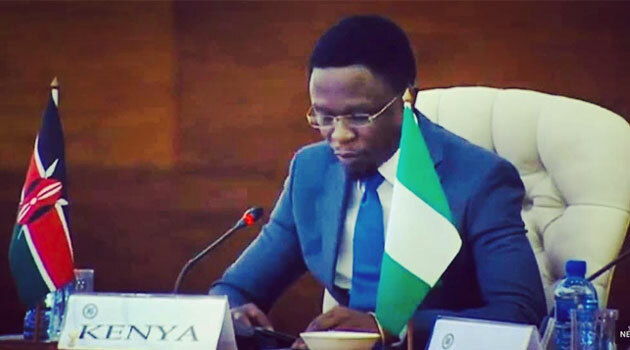 Indeed the right to self-determination and independence is the very DNA of Pan Africanism and the Organisation of African Unity (OAU), now the African Union (AU),” Namwamba said. He particularly drew the participants’attention to the 1979 Resolution A/RES/34/37 of the Thirty-fourth Session of the United Nations General Assembly on the “Question of Western Sahara” which, inter alia, reaffirmed “…the inalienable right of the people of Western Sahara to self-determination and independence, in accordance with the Charter of the United Nations, the Charter of the Organisation of African Unity and the objectives of General Assembly Resolution 1514 (XV), and the legitimacy of their struggle to secure enjoyment of that right, as envisaged in the relevant resolutions of the United Nations and the Organisation of African Unity”. Kenya has also remained consistent through time in its support of the grand project of the OAU/AU to complete the decolonization of Africa.